Short Info:- Following article is about the official notification regarding the SBI Clerk (Junior Associate) Recruitment 2019. The department, State bank of India has published this recruitment to fill up 8904 posts. This recruitment is for the Junior Associate profile. The online applications have started from 12 April 2019. To know more about this post, please keep scrolling down. State bank of India has published a recruitment notification (CRPD/CR/2019-20/03). The notification is for the recruitment of SBI Clerk Recruitment 2019. Here you will get complete information about the SBI Clerk (Junior Associate) Recruitment 2019. You can check complete information about the declared recruitment application fees, age limit, eligibility, number of vacancies, application process, important dates, pay scale and important links. If you have any doubts about the SBI Clerk (Junior Associate) Recruitment Online Application form process, you can ask us by just dropping the comments in the comment box. The department, State Bank of India is going to invite the candidates to fill the Junior Associate profiles. Department has invited the eligible candidates for the same. Aspirants who want to get the State Bank of India job can encash the opportunity. The SBI Clerk (Junior Associate) Recruitment 2019 has consisted of 8904 vacancies for Junior Associate profiles. Candidates can apply for the same from 12 April 2019. All the important links are available here. Stay tuned to us www.testhill.com to know further updates. The State Bank of Indian will be conducted the written examination (Pre and Mains) during the 1st phase of the recruitment. The appeared candidates will then proceed to the next level which will be the interview process. Before applying for the SBI Junior Associate Recruitment 2019, the aspirants are advised to read the whole official notification. The candidates should be eligible in all required aspects to apply for the same. 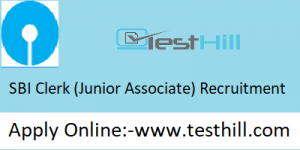 To apply for the SBI Junior Associate Recruitment 2019 they have to register themselves in the official website i.e. www.sbi.co.in. The SBI Recruitment 2019 Online Applications have available from 12 April 2019 to 3 May 2019. If you are going to apply for the same, check the important dates prior to applying. We’ve updated all of them below. This contains Educational Qualification, Age Limit, application fee, etc. Information is given below. Candidate must have Bachelor Degree from any recognized university will be considered for this recruitment.